Hasbro® has a premiere line of toys that are perfect for boys of all ages. Check out these fantastic options that are sure to be a hit with boys everywhere this holiday season! My boys are ready to save the day with their new superhero toys from Hasbro®. Transformed into Captain America™ complete with a Motorized Launcher and Hero Mask, even villains (translate to their little sister and our dog, Jack) had better beware. 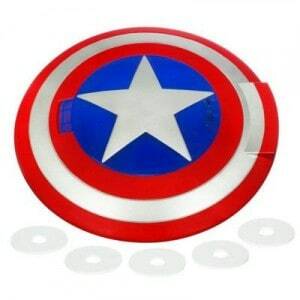 The Captain America™ Disc Launching Shield (SRP $19.99) includes five soaring discs that can be launched up to 20 feet in the air! Designed for ages 5 and up, this toy is so much fun and it is easy to use. I gave the rules upfront to my children, no launching or aiming at any living thing and with that having been said they promptly agreed and played with this toy outside for two hours and then again every day since. The Captain America™ Hero Mask instantly gave my son the ability to become one of his favorite superheroes. He and his younger brother joined forces to team up against “evil” in lots of pretend play adventures. The mask is very sturdy and has padding around the eyes and an adjustable Velcro closure making it very comfortable to wear. You can purchase the Captain America Disc Launching Shield and Captain America™ Hero Mask by visiting the Hasbro website or at retailer’s nationwide. While you are thinking about fun gift ideas or great stocking stuffers, Hasbro® Action Figures are always a big hit in my children’s Christmas stockings. From Star Wars to G.I. Joe there are sure to be favorite characters for children ages 4 and up. I love that action toys are always a classic toy that promotes pretend play and stirs my children’s imagination. My children are ages 4, 5 and 6 and have just started to actively engage in play using their favorite action figures. I love to quietly sit back and observe their play and it is so much fun to hear how they can create a storyline using their action figures. Hasbro® has a complete line of action figures available including Star Wars-Return of the Jedi and G.I. Joe. I like that the action figures also include lots of accessories to make play even more interesting. 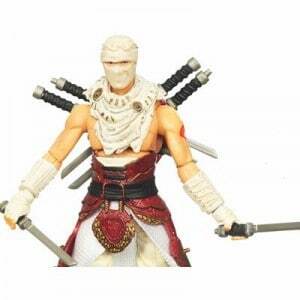 There is even action such as the “Whirlwind Kick” included with the Storm Shadow Cobra Ninja® in the G.I. Joe action figure collection. Hasbro® Action Figures are such an affordable gift idea at $4.99-$7.99 each and it is sure to get lots of use during play. You can visit the Hasbro® website to purchase your favorite action figures or to browse the entire selection.